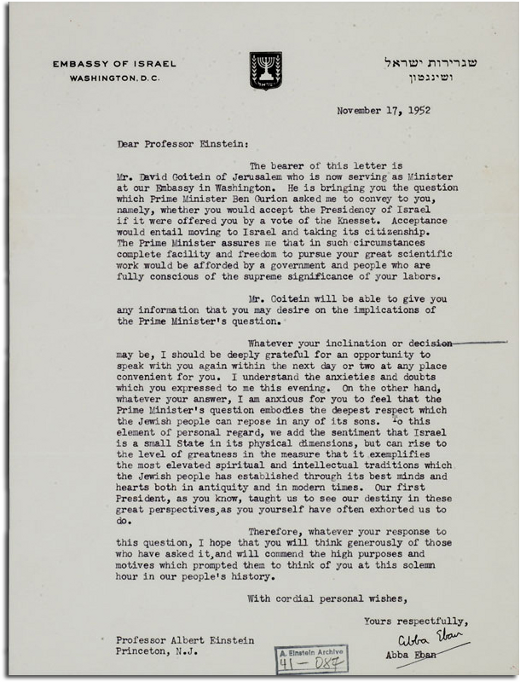 On November 17th of 1952, following the death of Israel's first President, then-Prime Minister David Ben-Gurion decided to offer the job to Albert Einstein by way of the following letter via the Embassy of Israel in Washington. As we now know, the offer was declined; the response can also be read below. 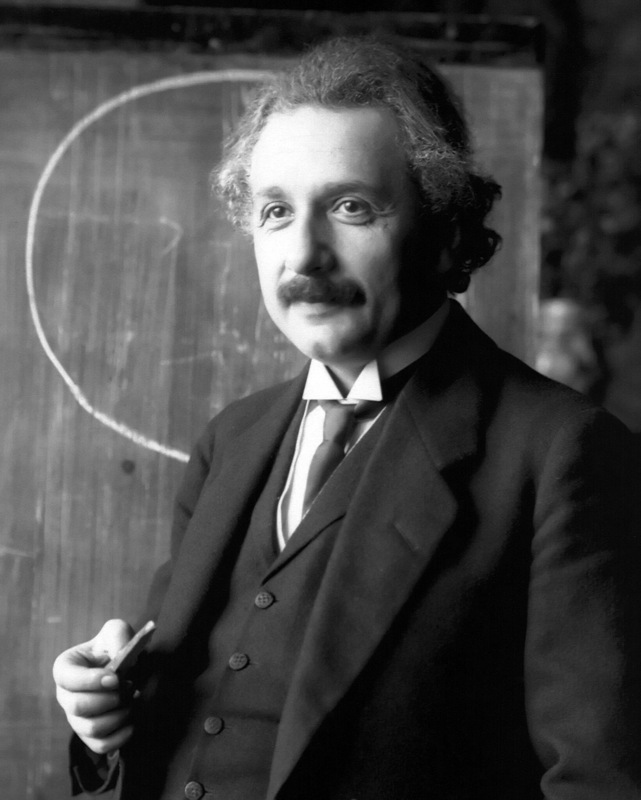 Less than three years later, Einstein passed away. The bearer of this letter is Mr. David Goitein of Jerusalem who is now serving as Minister at our Embassy in Washington. He is bringing you the question which Prime Minister Ben Gurion asked me to convey to you, namely, whether you would accept the Presidency of Israel if it were offered you by a vote of the Knesset. Acceptance would entail moving to Israel and taking its citizenship. The Prime Minister assures me that in such circumstances complete facility and freedom to pursue your great scientific work would be afforded by a government and people who are fully conscious of the supreme significance of your labors. Mr. Goitein will be able to give you any information that you may desire on the implications of the Prime Minister's question. Whatever your inclination or decision may be, I should be deeply grateful for an opportunity to speak with you again within the next day or two at any place convenient for you. I understand the anxieties and doubts which you expressed to me this evening. On the other hand, whatever your answer, I am anxious for you to feel that the Prime Minister's question embodies the deepest respect which the Jewish people can repose in any of its sons. To this element of personal regard, we add the sentiment that Israel is a small State in its physical dimensions, but can rise to the level of greatness in the measure that it exemplifies the most elevated spiritual and intellectual traditions which the Jewish people has established through its best minds and hearts both in antiquity and in modern times. Our first President, as you know, taught us to see our destiny in these great perspectives, as you yourself have often exhorted us to do. Therefore, whatever your response to this question, I hope that you will think generously of those who have asked it, and will commend the high purposes and motives which prompted them to think of you at this solemn hour in our people's history. I am deeply moved by the offer from our State of Israel, and at once saddened and ashamed that I cannot accept it. All my life I have dealt with objective matters, hence I lack both the natural aptitude and the experience to deal properly with people and to exercise official functions. 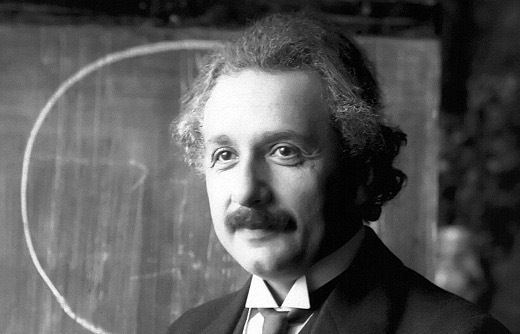 Therefore I would also be an inappropriate candidate for this high task, even when my old age didn’t interfere with my forces more and more [...] I am the more distressed over these circumstances because my relationship to the Jewish people has become my strongest human bond, ever since I became aware of our precarious situation among the nations of the world.